Wedding season is under way and the beautiful dresses are hitting the shelves of our favourite shops! I'm going to my mum and dad's silver wedding party in August and they're also renewing their vows so I'm technically a bridesmaid for the day and I'm so bloody excited. I've been a bridesmaid once in my life when I was like 6 at my Aunty and Uncle's wedding which was amazing so I'm lapping up this opportunity to find the perfect wedding guest esque / bridesmaid style dress and I thought I'd share with you some of my favourites. This dress is beautiful and would make the perfect bridesmaid dress if you love simplistic designs. I love the satin material and the cute extra detail on the back of the dress. It's stunning. I like the concept of multiway dresses and I think if a bride is looking for a dress that will suit all shapes and sizes for her bridesmaids, then this is the one. You can change the way the top half of the dress looks so you could have it with a crossed back or halterneck or even one shoulder - the choice is yours and the options are endless. You just need to be creative with it! I think the intricate embellished back detail is what makes this dress. It's simple, yet has a pop of sparkle and you would look amazing next to the bride wearing this. Ok so I think this is my favourite of the maxi dresses. I absolutely love this. It's sparkly, yet simple in colour and I think it would look amazing during the night do under the disco lights. This is another beautiful maxi dress and would look amazing with a tan. I love the bardot detail and the blush pink colour is one of my favourites at the moment. I could see this at a beach wedding in the sunshine. This is absolutely beautiful. The colour for one is gorgeous, then there is the delicate flower detail on the corset and the lovely tutu style mid length skirt. I think this would suit all skin tones and all shapes and sizes. This is a potential for my mum and dad's silver wedding. I love it so much. This is a cute little wedding guest number. It's fun, flirty and again, the colour would look fab with a tan. I like the lace overlay details and the off the shoulder look. It would look great at the after party too. This is a beautiful mid length dress, and very bridal esque. Some may say it's risque to wear cream to a wedding as you look very similar to the bride, but this dress would look amazing if you were a bride that didn't follow trends. When my aunty and uncle got married my aunty wore a beautiful gold dress so not all brides wear the generic cream/white. 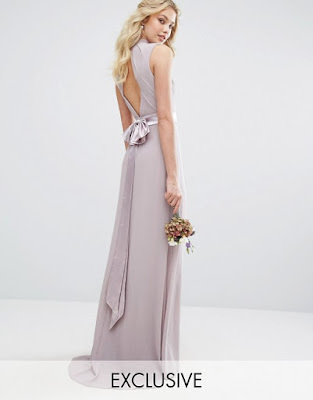 What are you favourite bridesmaid / wedding guest dresses for the summer season? I'd love to see some more options in the comments below.